Top five pieces of high-tech trip gear! Seeing as how the weather is heating up again, people are quickly making plans to hit the road in search of their next sunny adventure. If you fall into this demographic, you won’t want to leave home without some of these latest examples of tech-forward gear that will help ensure your trip is more convenient, safe and most importantly, fun. 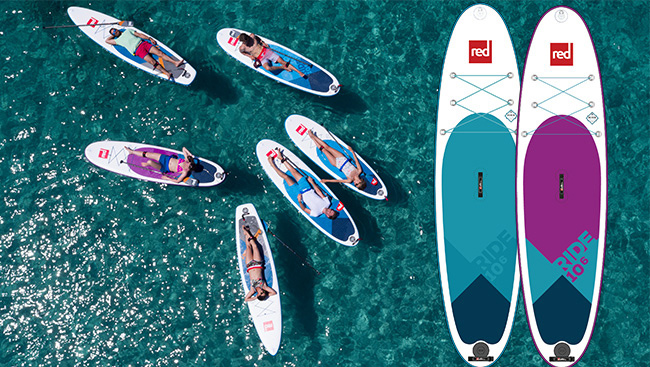 Stand-up paddle (SUP) boarding is taking the leisure watersports world by storm. Like standard surfing, getting into the sport can be a little overwhelming, not to mention intimidating, what with all the different types of equipment and the large footprint of the boards themselves. Enter Red Paddle Co (RPC). Although co-founded by a professional windsurfer, RPC offers beginner-friendly products like the Ride 10’6”, an inflatable SUP that fits neatly into the sturdy supplied carry backpack on wheels. Called a Swiss Army knife board because almost any rider can use it for any purpose, the board setup is almost as basic as flicking out the blade on the famous pocketknife. 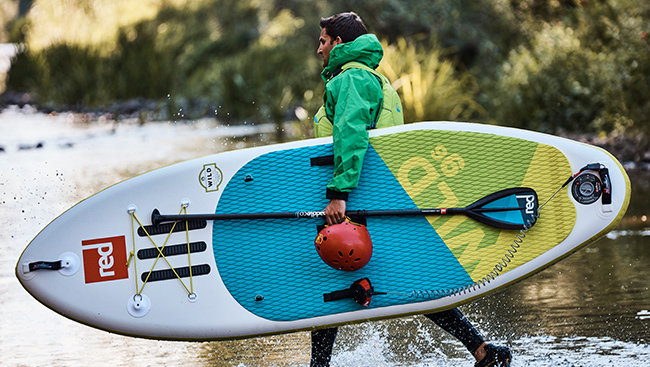 Simply unfold and inflate the SUP using the bundled Titan quick hand pump, and you’ve got a full-size, 120-millimetre thick board capable of supporting a maximum 100 kilograms. Every bit as sturdy as a hard variant, its 812-millimetre width provides a good base that’s easy to stay standing on. Three fins mounted on the underside assist the Ride in gliding straight through water and even a little surf smoothly and effortlessly, and turns prove to be cinch too. Everything seems to be smart these days. So why not luggage? 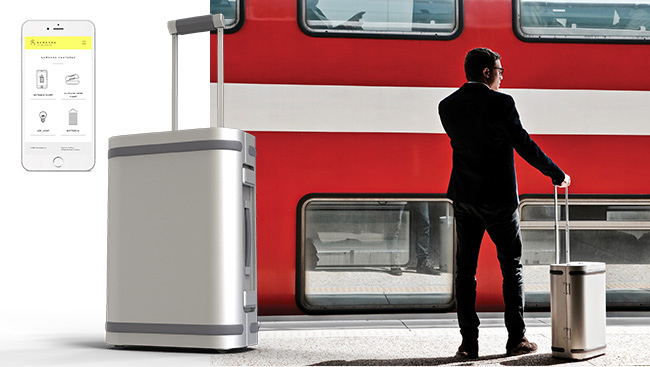 Samsara is answering the call and attempting to combine technology and style with what it calls the world’s first smart aluminum suitcase. The startup’s product is crafted from aviation grade aluminum for durability and weight savings. The design is both aesthetically pleasing and functional – when propped up, the perfectly flat sides turn the suitcase into a stable travel desk perfect for banging out an email or watching YouTube. The minimalistic wheels are constructed in a way that reduces internal protrusion saving four liters of space in the main compartment. An integrated power bank provides 10 full smartphone charges, there’s an LED nightlight inside, and if you download the soon-to-be-released Samsara app, it will tell you where your suitcase is and if it has been opened by an unauthorized party. Thanks to the rise of Instagram, it’s hip to be square again. 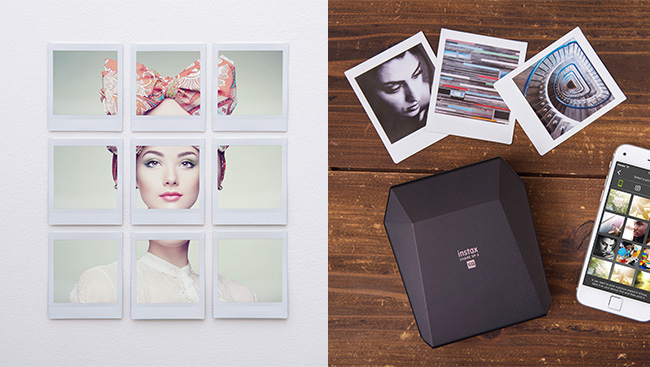 The SHARE SP-3 printer utilizes Instax’s new square film format and wireless connectivity to generate prints in the popular 1:1 aspect ratio, on the go. Turning digital images on a mobile device into physical photos is a snap: install the companion SP-3 app, and before uploading the shot to the printer, get creative and manipulate the image in different ways. For instance, you can combine nine separate photographs into one by choosing the Collage Template option, or superimpose stylized text using My Template. Aside from editing a raw image, the app can grab media from social media sites like Facebook and Instagram. Or, if you have a compatible Fujifilm digital camera, it’s possible to beam photos taken directly to the SP-3 itself. Sold in black or white, the casing has a neat geometric appearance and is compact enough to throw into your bag. This American consumer electronics company has recently launched its most powerful line of portable Bluetooth trackers, called the Pro Series, as well as an improved app. The Bluetooth range has doubled totalling 60 metres, the internal speaker volume made twice as loud, and the units are now waterproof up to a depth of 1.5 metres for 60 minutes. Available in two flavours, the Tile Sport looks, well, sportier featuring a textured grid-like black cover and smoked trim, while the Tile Style has an elegant white slatted cover and gold accents. Operation is simple: download the app, pair the devices with a touch of a button and afterwards it will show exactly where they are. As a bonus, you can also press the centre button on the Sport or Style causing your phone to ring if that gets lost instead. Wanting something to tuck into a wallet or stick onto a laptop instead? Check out the Tile Slim, no thicker than a couple of credit cards stacked together. For those seeking to capture memories of their outdoor activities, look no further than the Fujifilm FinePix XP-series of lightweight point-and-shoot cameras. The XP130 model was just launched, which is not only waterproof (up to 20 metres) but also shockproof (will survive a drop from 1.75 metres), freezeproof (can survive in -10 C) and dustproof so you can shoot while paddle boarding or snowshoeing. Improvements over the outgoing XP120 include Bluetooth Pairing allowing images shot on the camera to be instantly retrieved via the FUJIFILM Camera Remote available for smartphones and tablets, or sent to an Instax SHARE printer. The XP130 boasts a 1080p HD movie recording capability, remote shooting function using a mobile device, and strategically sized and placed buttons made for one-handed operation. Wearable technologies, online applications and games such as Lumosity empower seniors to independently monitor their health and daily lifestyle such as sleeping pattern and heart rate.